It's the stuff of an Indiana Jones movie: supernatural kings, ancient tombs, and government-backed archaeologists striving to harness the power of legend for a greater cause. "We had lived together for 5,000 years but apart for just 70 years," said Moon, whose parents came from what is now North Korea. The legend of Dangun, however, plays a lasting role in promoting unification because it portrays Koreans as a homogenous group destined to live together, said Jeong Young-Hun, a professor at Seoul's Academy of Korean Studies. "Dangun is a basis for Koreans to feel the necessity for pursuing harmony and unification," he said. "Dangun is a basis for seeing unification as something possible." "In both Koreas, (Dangun) has been used to emphasize the uniqueness, the singularity, homogeneity and antiquity of the Korean people," said Michael Seth, a professor of Korean history at James Madison University in Virginia. "Whether a real person or not, he is used by both Koreas to emphasize the unity as well as the uniqueness of the Korean people." "Dangun is a myth," said Yeungnam University archaeologist Lee Chung Kyu. North Korea's founders originally disdained the story of Dangun as superstition incompatible with their ostensibly socialist ideology. However, officials have since gone to great lengths to capitalize on the mythology and cement the ruling Kim family's claim to Dangun's legacy. Official North Korean narratives have claimed Mount Paektu as the "sacred mountain of revolution" and assert that Kim Jong Un's father, Kim Jong Il, was born on its slopes. Many historians place his actual birthplace in the former Soviet Union. In the mid-1990s, North Korean authorities announced they had discovered the tomb of Dangun and his wife just outside Pyongyang, going so far as to "reconstruct" a white stone pyramid flanked by rough-hewn obelisks and statues of ancient princes and snarling beasts. Amid a previous temporary thaw in relations between the two Koreas in 2007, a delegation led by South Korea's defense minister visited Dangun's royal tomb, and Pyongyang gave permission for South Korean tourists to visit Mount Paektu. 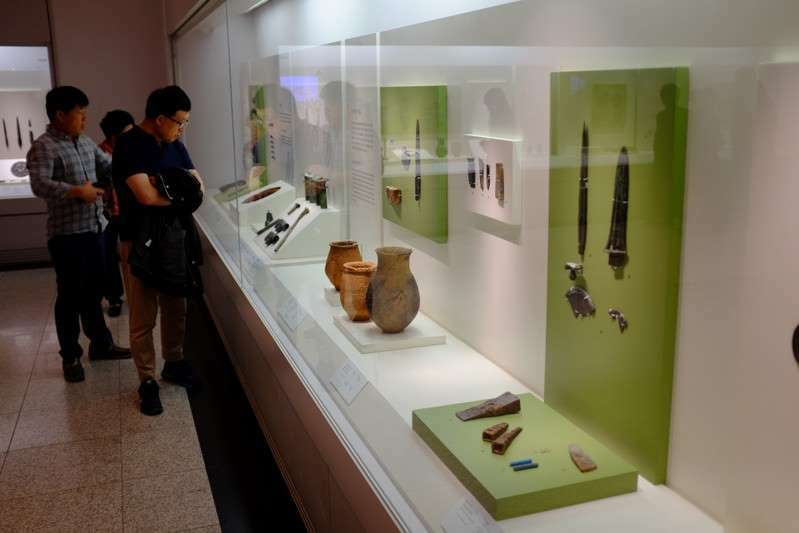 Seoul's National Museum of Korea has a display of bronze daggers, ceramics, and other relics said to be from the period and credited as "the first state ever to emerge on the Korean Peninsula". Signs at the museum say Gojoseon lasted from 2,333 BCE to 108 BCE and "was powerful enough to compete as equals" with major dynasties in China. However, historians say details are disputed and have often been manipulated for political purposes. "The early part of Gojoseon cannot be recognized as a state, especially not as a homogenous ethnic nation-state," said Yeungnam University's Lee, who argues the period was more likely marked by chiefdoms or tribes that only much later formed a more unified kingdom. The myth has sometimes been misused, leading to "chauvinism and extreme nationalism," Lee said. On the same day in North Korea, senior unification officials visited the mausoleum to perform an "ancestral sacrifice for Dangun" and call for a unified Korea. Jeong said the unifying themes of Dangun and Gojoseon are "imperative" as the two Koreas try to overcome their differences. "The most important ground for justifying unification can be found in the idea that we are a homogeneous group bound together by a common destiny – that we have lived as one throughout history and we have to continue to do so in the future,” he said.